An Air Algerie flight carrying 110 passengers and six crew members has reportedly crashed in Mali after having disappeared from radar early on Thursday morning between Burkina Faso and Algeria. Malian state TV reports that the wreckage of the Air Algérie flight was found close to the Malian town of Gossi. According to AP, this information has been confirmed by a Burkina Faso official. "We have found the Algerian plane. The wreck has been located...50 kilometers (30 miles) north of the Burkina Faso border" in the Malian region of Gossi, General Gilbert Diendiere of the Burkina Faso army said, as quoted by AFP. "Sadly, the team saw no one on site. It saw no survivors," said Diendiere, a close aide to Burkina Faso President Blaise Compaore, and the head of the crisis committee set up to coordinate the search operation. Malian President Ibrahim Boubacar Keita is expected to visit the crash scene on Friday, according to Reuters. Early morning on Friday, France said it had sent troops to secure the site of the wreckage of the Air Algérie flight, Reuters reported. "A French military unit has been sent to secure the site and gather the first elements of information," a statement from French President Francois Hollande's office said. A French Ministry of Defense had told Fox News earlier that the two French fighter jets located the wreckage, while the airline placed the likely location of the crash further south west. 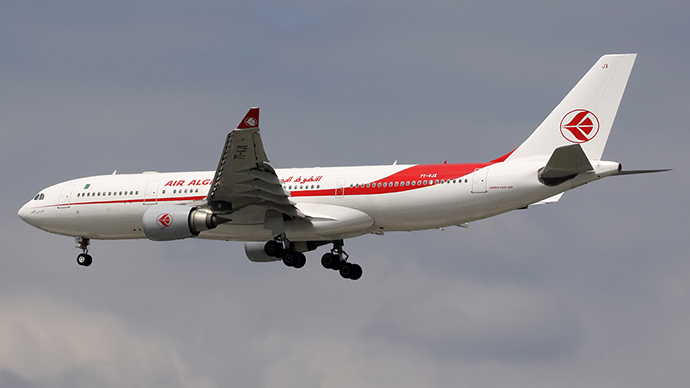 “The plane would have crashed in the region of Tilemsi, 70km from Gao,” Air Algerie tweeted. However, moments beforehand, French Foreign Minister Laurent Fabius had announced at a press conference that the plane was still missing. A spokeswoman for Spanish private airline company, Swiftair, confirmed that it had lost contact with one of its planes operated by Air Algerie on Thursday. The plane was an Air Algerie MD-83, flight AH5017. "Air navigation services have lost contact with an Air Algerie plane Thursday flying from Ouagadougou to Algiers, 50 minutes after take-off,"the airline said. Swiftair said that there had been “no contact” with the missing aircraft since. French Transport Minister, Frederic Cuvillier, told reporters that it was “likely many” French passengers were on board the flight. "There are 110 passengers and 6 crew traveling on the plane, of which four are pilots and two cabin crew," the Swiftair statement confirmed. The crew members were Spanish. A representative for the airline told a news conference that according to passenger lists, some 50 French nationals were traveling on the route. Additionally, there were 24 Burkinabe, eight Lebanese, four Algerians, two from Luxembourg, one Belgian, one Swiss, one Nigerian, one Cameroonian, one Ukrainian and one Romanian. Burkina Faso’s transport minister confirmed that the Air Algerie flight had asked to change course at 1:38 am GMT because of a storm. “We are totally mobilized, both in Paris, and at crisis centers in Algiers and Ouagadougou, where our embassies are in constant contact with local authorities and the airline,” the French Ministry of Foreign Affairs said in a statement on their website. Two French fighter jets have been dispatched to help locate the flight, a French army spokesperson told Reuters. "Two Mirage 2000 jets based in Africa were dispatched to try and locate the Air Algerie plane that disappeared on Thursday." Gilles Jaron said. "They will search an area from its last known destination along its probable route," he added. The Algerian Ministry of Defense has not ruled out the possibility of a terrorist attack, reported Al Arabiya. However, French officials told AP that it is unlikely that fighters in Mali had the kind of weaponry capable of shooting down a plane. The missing AH5017 was found to be an old Real Madrid plane, 'La Saeta', which was used by the club between 2007 and 2009. However, Mariela Castro later told Venezuelan channel TeleSUR by telephone that she was 'alive' denying all reports that she had been a passenger. "I'm alive and kicking, happy and healthy," she said. The airport's Facebook page later removed the statement. Initial reports of the crash were confirmed by Algerian aviation authorities. "I can confirm that it has crashed," an anonymous official later told Reuters. Early reports from the CCTV network and Algerian TV suggested that it went down in Niger rather than Mali.